A lawsuit against Airbnb on racial discrimination cannot be decided by a jury trial, effectively blocking the possibility of a class-action lawsuit, a judge ruled Tuesday. The U.S. district court judge said the company’s arbitration policy, to which users must agree to in its Terms of Service, requires all disputes between user and owner be decided in arbitration, rather than in a court of one’s peers. “Mutual arbitration provisions in electronic contracts — so long as their existence is made reasonably known to customers — are enforceable, in commercial disputes and discrimination cases alike,” U.S. District Court Judge Christopher Cooper wrote. Gregory Selden, who is African-American, is at the center of the case. Selden alleged that when trying to rent a room in Philadelphia using Airbnb, the host denied him because of his race. Selden’s profile contained his name and picture. After he was rejected, Selden created a fake account using the picture of a white person, and the host agreed to rent him the room, according to court documents. Short-term housing rental industry giant Airbnb now lists more than 1 million rooms available in 192 countries. The platform’s largest market is in New York City, with more than 25,000 listings per night, but it’s also where the debate over how to regulate short-term rentals is the most contentious. In light of a new report by the NY Attorney General that says nearly three-quarters of Airbnb’s listings in the city are technically illegal, the city is cracking down. Hari Sreenivasan reports. Selden sued Airbnb in May, claiming racial discrimination against him and other African-American users with similar grievances against the company. Supporters of Selden’s claim took to social media after he filed his suit, using #AirbnbWhileBlack to share their experiences with discrimination using the service. Selden plans to appeal the judge’s decision to uphold the arbitration process, which his lawyer said gives Airbnb an unfair advantage. “By placing Mr. Selden’s claims into arbitration, a consumer’s constitutional right to a jury trial and access to the courts of law continues to be whittled down gradually but surely,” attorney Ikechukwu Emejuru said in a statement. In September, Airbnb responded to complaints of racial bias, apologizing for its slow response to discrimination accusations and putting out its own report detailing how it would make the service more inclusive. 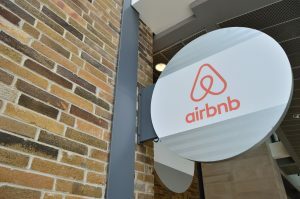 The company did not remove photographs from users’ profiles, but all users must now agree to the Airbnb “Community Commitment,” which forbids discrimination, while saying users are part of an “Airbnb community,” the Associated Press reported. This ruling comes at a time when other companies that rely on the gig economy are being accused of racial and gender discrimination. A study released last month asserted that drivers for ride-sharing companies Uber and Lyft discriminate against users with “African-American-sounding names” and that drivers took women on longer, more expensive trips.